It's a big if but, if Mayo beat Dublin in a two weeks time the Dubs won't be contesting another league final, Mayo will have 8 points and the head to head. Kerry already have the head to head over them. With respect to Galway, not a huge lot to say about the match in Inniskeen yesterday apart from the fact that it's a massive win in the context of staying up in Division One, even just picking up another win should be enough to stay up given that Tyrone, Cavan and Monaghan all have to play each other still plus Cavan and Tyrone have yet to play Dublin who will be improving their performance a bit as the league goes on. First twenty minutes it was as bad a Galway start to a match as I can remember, loose on the Monaghan players despite flooding the defence, lazy tackling technique giving handy frees away, poor usage of the wind (although Monaghan suffered from the same affliction in the second period), bad shot selection/execution (the missed goal chances were horror shows), hard to pick out anything positive. Got going a bit towards the end of the half with Shane Walsh becoming influential but to be honest I thought I'd be able to leave early in the second half as I couldn't see anything but a Monaghan win with the advantage of the elements to come. Credit to Galway in that they upped it significantly in the second half but really it was a tough ground out win, the goal was obviously the crucial score in the match. Tom Flynn was immense down the stretch and played well in general, Duane and Sean Kelly (unreal engine on the lad) had effective games, Walsh was obviously a cut above the other players when he got going. Cunningham gets himself into great positions but he isn't there yet by any means with his overall finishing, could (probably should to be honest) have scored a goal in every league game so far, in mitigation he was clearly fouled in the first half yesterday when going through on goal but still. A lot of criticism being heaped on Galway, some justified, but entertainment value is certainly not a metric that would bother me in early February. There is plenty of work to be done but (with all due respect to Sligo and London we are at nothing if we can't win those two championship matches) this year it's all about retaining Division One status while getting the squad and team primed for the 16th of June and hopefully deep into July and August. For all the hyperbole about the match Saturday night, and it was a great game to watch, it's just a Round 3 match in February, I don't buy the "laying down a marker for the year" narrative for a second, Kerry have done that a few times in recent league campaigns against Dublin only to be well short come the summer. The way Galway are playing right now won't beat Dublin and KW will have to come up with something at least a bit different or it'll be groundhog day if we can get far enough to play Dublin again but rehearsed lines about "football purgatory" or lamenting Galway a la Eamonn Sweeney this morning at this time of year is daft. It would be remiss not to comment on the super facilities that are in place in Inniskeen, especially for what seems a small enough club, it's a credit to the locals. No hassle to get in/out of and the pitch was in immaculate condition for this time of year as well. The Dubs don't care about this league. 2 losses out of 3 says it all. All the muppets who backed the machine at 4/7 in early January will get hosed. Good man seafoid. Clueless as always. Dubs don't want a distraction of a league final so deliberately lost to Kerry. Threw Flynn and Macauley on to make sure we wouldnt come back. Accidentally clawed it back to level, but gave them a handy point to win it, and Fento blazed the last one wide rather than try to work it into an easier position, just to make sure Kerry took all 2 points. 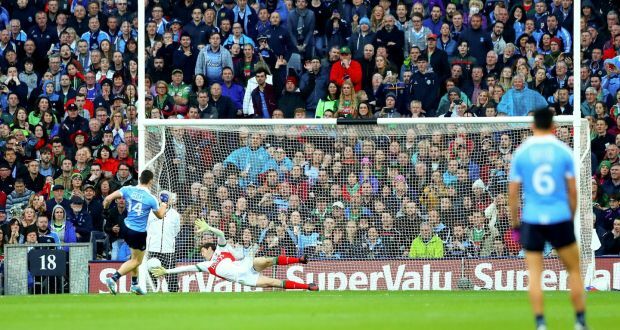 Most probably (with any degree of certainity) only the addition of Cluxton to the line up would have swung that game Dublin's way. Though Dublin did finish strong, Kerry held them up and had something extra left in the tank in the final minutes. They don't care about the league. Flynn and Macauley get a bit of game time but the result is irrelevant. Fento blazing one wide wouldn't account for the gap , would it ? Dubs are back at their home ground again - SORRY not their home ground. Their rented home, that's located in the same county and within view of their home ground. Do the Dubs have to pay rent to use CP? Somehow I imagine there's a virtual red carpet laid from their training ground to CP. Yes that would be the case , Dublin were that little bit better than us , possibly had them in 16 if bastick had of been pulled for the clear off the ground pick up with the hands , it was a free in to win the all Ireland ,cillian had just scored a screamer to level it from about 40yrds out , absolute shoe in to score from a 21 free. Anyway them days are past now . So I don't believe Horan would of made any difference ,to answer your question. You'll never get those tight calls in an away fixture.